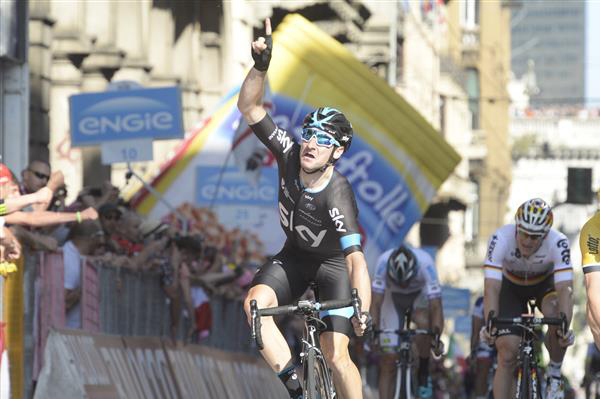 The Race: Elia Viviani had a good day today, winning his first-ever Grand Tour stage. 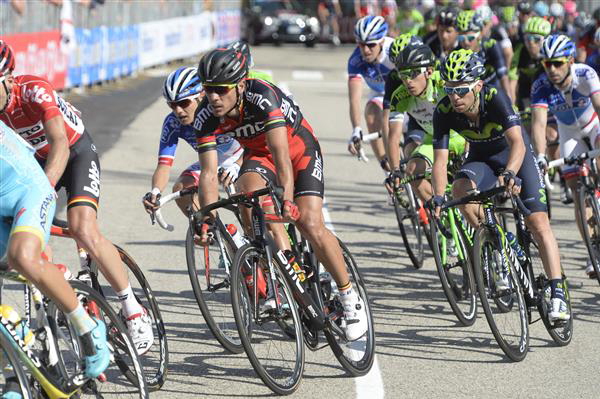 In the stage's first kilometers a six-man break went clear. At one point they had a nine-minute lead. 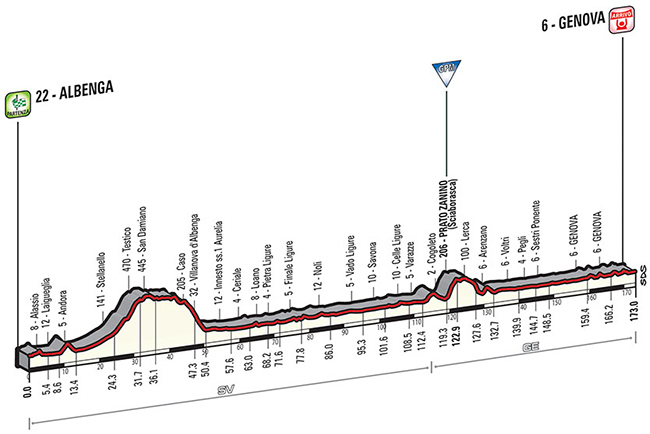 But this is the Giro and they weren't going to be allowed their stage win. 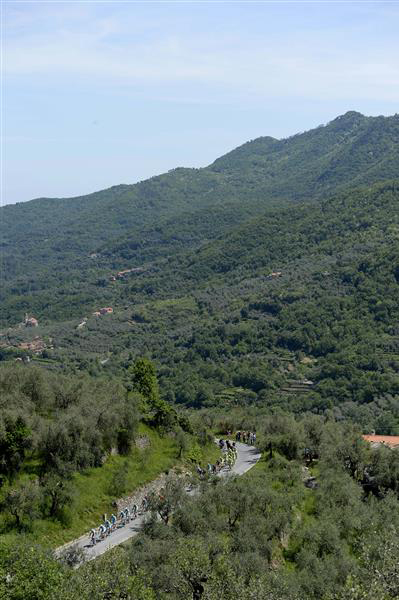 With about eleven kilometers remaining they were swallowed up by the fast-moving peloton, setting things up for a big sprint. 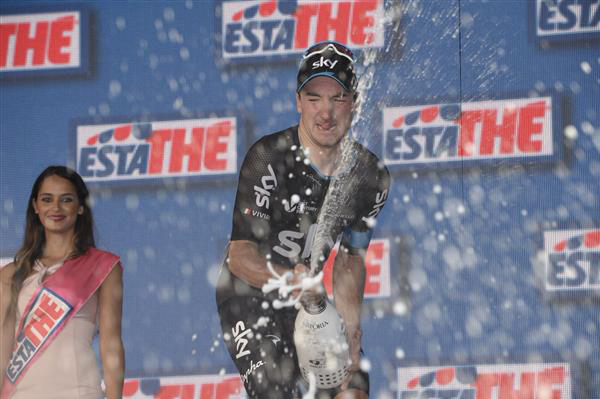 Viviani was on-form today, winning the stage. 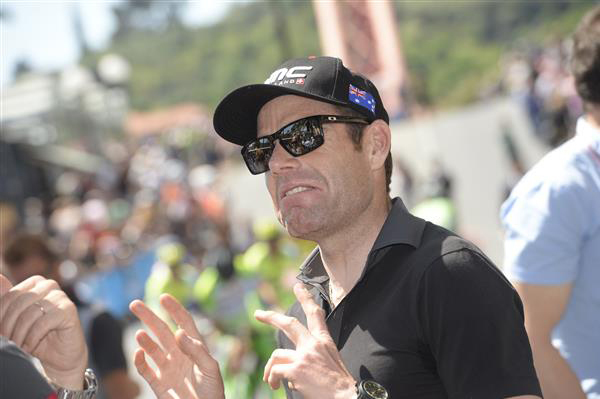 The GC lead moved to another Orica-GreenEdge rider. Today, it went to Michael Matthews, who came in seventh. 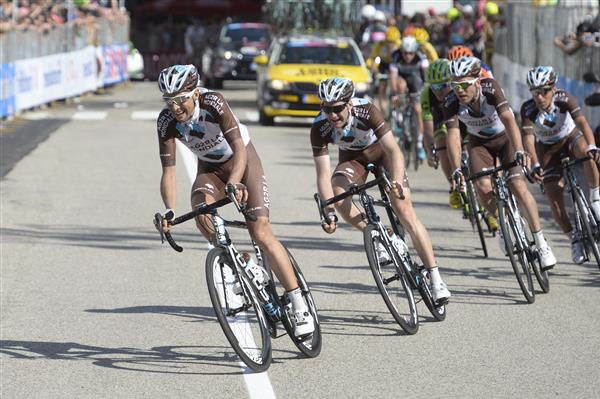 Notably, Ag2r's GC man for the Giro, Domenico Pozzovivo gave up more than a minute today. That will be hard to make up. 2 HOFLAND Moreno LottoNL-Jumbo s.t. 4 MEZGEC Luka Giant-Alpecin s.t. 5 PETACCHI Alessandro Southeast s.t. 6 NIZZOLO Giacomo Trek s.t. 7 MATTHEWS Michael Orica-GreenEdge s.t. 8 APPOLLONIO Davide Androni Giocattoli s.t. 9 COLLI Daniele Nippo-Vini Fantini s.t. 10 TIRALONGO Paolo Astana s.t. 14 MATYSIAK Bartlomiej CCC Sprandi Polkowice s.t. 15 PORSEV Alexander Katusha s.t. 16 URAN Rigoberto Etixx-Quick Step s.t. 17 CLARKE Simon Orica-GreenEdge s.t. 19 GERRANS Simon Orica-GreenEdge s.t. 20 IZAGUIRRE Jon Movistar s.t. 21 BURGHARDT Marcus BMC s.t. 22 PORTE Richie Sky s.t. 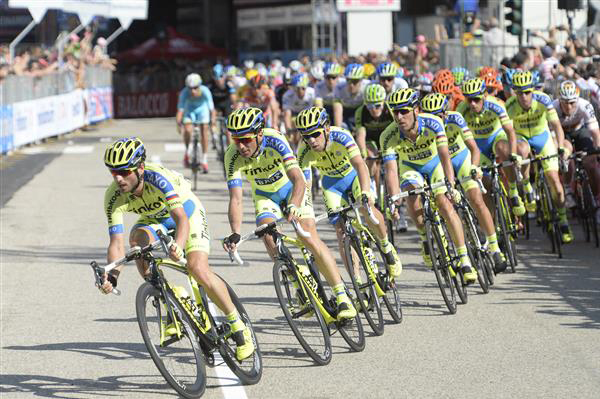 24 CONTADOR Alberto Tinkoff-Saxo s.t. 25 ROSA Diego Astana s.t. 26 MONSALVE Jonathan SoutheAstana s.t. 27 CUNEGO Damiano Nippo-Vini Fantini s.t. 28 KRUIJSWIJK Steven LottoNL-Jumbo s.t. 29 CLEMENT Stef IAM Cycling s.t. 31 BETANCUR Carlos Alberto Ag2r s.t. 32 SIUTSOU Kanstantsin Sky s.t. 33 CHAVES Johan Esteban Orica-GreenEdge s.t. 35 PAOLINI Luca Katusha s.t. 36 KONIG Leopold Sky s.t. 39 REZA Kevin FDJ s.t. 40 RUFFONI Nicola Bardiani-CSF s.t. 41 GAVAZZI Francesco Southeast s.t. 42 KEIZER Martijn LottoNL-Jumbo s.t. 44 SANCHEZ Luis Leon Astana s.t. 45 KIRYIENKA Vasil Sky s.t. 46 HESJEDAL Ryder Cannondale-Garmin s.t. 47 ELISSONDE Kenny FDJ s.t. 50 TROFIMOV Yury Katusha s.t. 51 PELLIZOTTI Franco Androni Giocattoli s.t. 52 LANDA MEANA Mikel Astana s.t. 53 MONFORT Maxime Lotto-Soudal s.t. 54 BONGIORNO Francesco Manuel Bardiani-CSF s.t. 55 MOUREY Francis FDJ s.t. 56 GENIEZ Alexandre FDJ s.t. 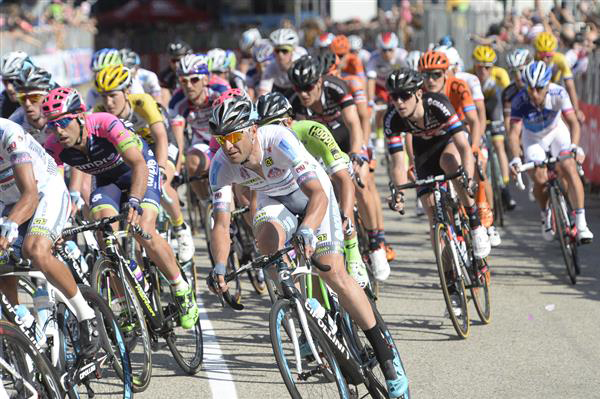 57 RICHEZE Ariel Maximiliano Lampre-Merida s.t. 58 ZAKARIN Ilnur Katusha s.t. 59 MOINARD Amaël BMC s.t. 60 DE NEGRI Pier Paolo Nippo-Vini Fantini s.t. 61 MALACARNE Davide Astana s.t. 62 RUTKIEWICZ Marek CCC Sprandi Polkowice s.t. 63 HENAO GOMEZ Sebastian Sky s.t. 64 BOOKWALTER Brent BMC s.t. 65 INTXAUSTI Benat Movistar s.t. 66 BOARO Manuele Tinkoff-Saxo s.t. 68 BATTAGLIN Enrico Bardiani-CSF s.t. 69 FELLINE Fabio Trek s.t. 70 VISCONTI Giovanni Movistar s.t. 72 BOUET Maxime Etixx-Quick Step s.t. 73 BEPPU Fumiyuki Trek s.t. 74 MEERSMAN Gianni Etixx-Quick Step s.t. 75 SLAGTER Tom Jelte Cannondale-Garmin s.t. 77 CARDOSO Andre Fernando Cannondale-Garmin s.t. 79 BELLETTI Manuel Southeast s.t. 82 BROECKX Stig Lotto-Soudal s.t. 83 ZILIOLI Gianfranco Androni Giocattoli s.t. 85 LUDVIGSSON Tobias Giant-Alpecin s.t. 90 BUSATO Matteo Southeast s.t. 91 MODOLO Sacha Lampre-Merida s.t. 92 HAGA Chad Giant-Alpecin s.t. 94 BANDIERA Marco Androni Giocattoli s.t. 100 SAMOILAU Branislau CCC Sprandi Polkowice s.t. 101 SZMYD Sylvester CCC Sprandi Polkowice s.t. 103 XU Gang Lampre-Merida s.t. 104 NIEMIEC Przemyslaw Lampre-Merida s.t. 105 ATAPUMA Jhon Darwin BMC s.t. 107 LAGUTIN Sergey Katusha s.t. 108 REICHENBACH Sébastien IAM Cycling s.t. 109 ZARDINI Edoardo Bardiani-CSF s.t. 110 HERRADA Jesús Movistar s.t. 111 FERNANDEZ Rubén Movistar s.t. 112 CHEVRIER Clement IAM Cycling s.t. 113 PIRAZZI Stefano Bardiani-CSF s.t. 114 FISCHER Murilo Antonio FDJ s.t. 115 BARBIN Enrico Bardiani-CSF s.t. 117 KOCHETKOV Pavel Katusha s.t. 119 STORTONI Simone Androni Giocattoli s.t. 120 ARMEE Sander Lotto-Soudal s.t. 121 ULISSI Diego Lampre-Merida s.t. 122 KANGERT Tanel Astana s.t. 123 ZABEL Rick BMC s.t. 124 PAULINHO Sergio Miguel Tinkoff-Saxo s.t. 125 GRMAY Tsgabu Lampre-Merida s.t. 127 VANDEWALLE Kristof Trek s.t. 129 FINETTO Mauro Southeast s.t. 132 DUPONT Hubert Ag2r s.t. 139 VAKOC Petr Etixx-Quick Step s.t. 142 MARANGONI Alan Cannondale-Garmin s.t. 143 DURBRIDGE Luke Orica-GreenEdge s.t. 144 ACEVEDO Janier Alexis Cannondale-Garmin s.t. 146 VAN DER LIJKE Nick LottoNL-Jumbo s.t. 147 KEISSE Iljo Etixx-Quick Step s.t. 148 CHAVANEL Sylvain IAM Cycling s.t. 149 CHIRICO Luca Bardiani-CSF s.t. 150 STACCHIOTTO Riccardo Nippo-Vini Fantini s.t. 151 FAIRLY Caleb Giant-Alpecin s.t. 154 PINEAU Cedric FDJ s.t. 155 FAVILLI Elia Southeast s.t. 158 TJALLINGII Maarten LottoNL-Jumbo s.t. 159 CHENG Ji Giant-Alpecin s.t. 160 CHERNETSky Sergey Katusha s.t. 161 ROUX Anthony FDJ s.t. 162 GATTO Oscar Androni Giocattoli s.t. 164 ZEITS Andrey Astana s.t. 165 BERLATO Giacomo Nippo-Vini Fantini s.t. 166 NOCENTINI Rinaldo Ag2r s.t. 167 HOULE Hugo Ag2r s.t. 168 MONTAGUTI Matteo Ag2r s.t. 169 TVETCOV Serghei Androni Giocattoli s.t. 170 GROSU Eduard Michael Nippo-Vini Fantini s.t. 171 FLENS Rick LottoNL-Jumbo s.t. 172 LOBATO Juan Jose Movistar s.t. 173 JUUL JENSEN Christopher Tinkoff-Saxo s.t. 174 WEENING Pieter Orica-GreenEdge s.t. 177 DOMONT Axel Ag2r s.t. 178 ZHUPA Eugert Southeast s.t. 179 FRAPPORTI Marco Androni Giocattoli s.t. 180 VOROBYEV Anton Katusha s.t. 183 MIHAILOV Nikolai CCC Sprandi Polkowice s.t. 184 BELKOV Maxim Katusha s.t. 188 HAUSSLER Heinrich IAM Cycling s.t. 190 DALL'ANTONIA Tiziano Androni Giocattoli s.t. 193 SARAMOTINS Aleksejs IAM Cycling s.t. 194 PELUCCHI Matteo IAM Cycling s.t. 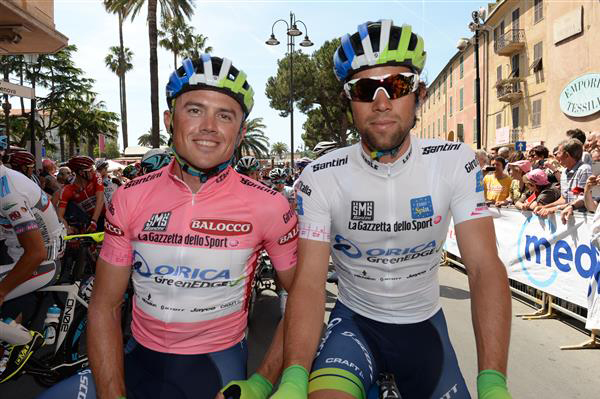 2 GERRANS Simon Orica-GreenEdge s.t. 3 CLARKE Simon Orica-GreenEdge s.t. 8 BOARO Manuele Tinkoff-Saxo s.t. 9 ROVNY Ivan Tinkoff-Saxo s.t. 11 ARU Fabio Astana s.t. 12 ROSA Diego Astana s.t. 13 CATALDO Dario Astana s.t. 14 SANCHEZ Luis Leon Astana s.t. 15 LANDA Mikel Astana s.t. 16 MALACARNE Davide Astana s.t. 19 URAN Rigoberto Etixx-Quick Step s.t. 20 BOUET Maxime Etixx-Quick Step s.t. 21 MEERSMAN Gianni Etixx-Quick Step s.t. 23 INTXAUSTI Benat Movistar s.t. 24 VISCONTI Giovanni Movistar s.t. 27 CLEMENT Stef IAM Cycling s.t. 28 BURGHARDT Marcus BMC s.t. 29 GILBERT Philippe BMC s.t. 30 GREIPEL André Lotto-Soudal s.t. 31 MOINARD Amaël BMC s.t. 32 BOOKWALTER Brent BMC s.t. 34 ELISSONDE Kenny FDJ s.t. 35 MOUREY Francis FDJ s.t. 36 GENIEZ Alexandre FDJ s.t. 38 PORSEV Alexander Katusha s.t. 39 SIUTSOU Kanstantsin Sky s.t. 40 KONIG Leopold Sky s.t. 41 NIEVE Mikel Sky s.t. 42 PAOLINI Luca Katusha s.t. 43 KIRYIENKA Vasil Sky s.t. 48 VAN DEN BROECK Jurgen Lotto-Soudal s.t. 53 KEIZER Martijn LottoNL-Jumbo s.t. 55 BONGIORNO Francesco Manuel Bardiani-CSF s.t. 56 BATTAGLIN Enrico Bardiani-CSF s.t. 59 MATYSIAK Bartlomiej CCC Sprandi Polkowice s.t. 61 PATERSKI Maciej CCC Sprandi Polkowice s.t. 63 GRETSCH Patrick Ag2r s.t. 67 MONSALVE Jonathan Southeast s.t. 68 GAVAZZI Francesco Southeast s.t. 69 BELLETTI Manuel Southeast s.t. 71 FORMOLO Davide Cannondale-Garmin s.t. 72 SLAGTER Tom Jelte Cannondale-Garmin s.t. 73 CARDOSO Andre Fernando Cannondale-Garmin s.t. 76 CUNEGO Damiano Nippo-Vini Fantini s.t. 80 PELLIZOTTI Franco Androni Giocattoli s.t. 91 FERNANDEZ Rubén Movistar s.t. 93 ATAPUMA Jhon Darwin BMC s.t. 94 ZABEL Rick BMC s.t. 98 ZARDINI Edoardo Bardiani-CSF s.t. 101 COLBRELLI Sonny Bardiani-CSF s.t. 104 HENDERSON Gregory Lotto-Soudal s.t. 107 SAMOILAU Branislau CCC Sprandi Polkowice s.t. 111 NIEMIEC Przemyslaw Lampre-Merida s.t. 112 MORI Manuele Lampre-Merida s.t. 113 ULISSI Diego Lampre-Merida s.t. 114 GRMAY Tsgabu Lampre-Merida s.t. 128 KOCHETKOV Pavel Katusha s.t. 135 VAN DER LIJKE Nick LottoNL-Jumbo s.t. 140 STACCHIOTTO Riccardo Nippo-Vini Fantini s.t. 156 EISEL Bernhard Sky s.t. 161 MONTAGUTI Matteo Ag2r s.t. 162 HOULE Hugo Ag2r s.t. 174 KEISSE Iljo Etixx-Quick Step s.t. 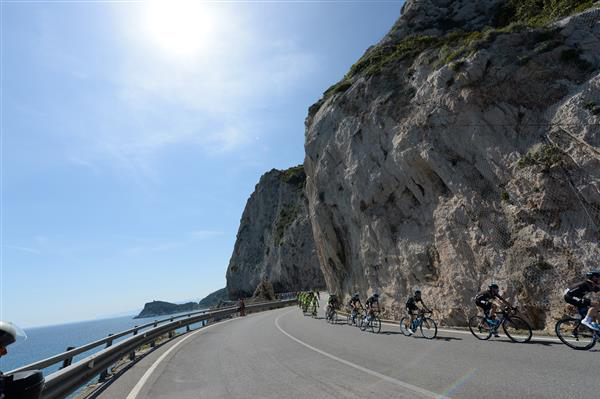 Nice day for a Giro d'Italia stage. Alessandro Petacchi now rides for the Southeast team. Elia Viviani enjoys his time on the podium.